We Bought Our House!, originally uploaded by punquin. Monday we sold our townhouse. Today we bought our new house. It's been a busy week already, to say the least. 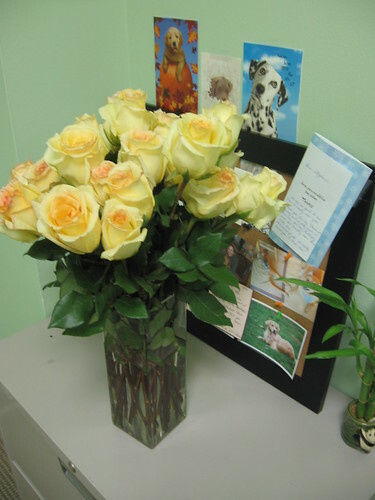 These roses are a gift to me from the title company. I've been sick all week. The medicine I took has me feeling like barfing right now. Food would probably help, but I don't want to go drive to get any. Who wants to have some breadsticks sent to my office? I'll update soon, I hope.